If you want to learn to play tennis, to re-learn tennis if you played tennis in the past or just to get more exercise, do come along and try our tennis sessions at Grasshoppers tennis club in Hove which start at 6:30 every Friday evening for complete beginners, less serious players or those who are just a bit rusty. The first session is free and group coaching is available to members most Fridays (see below) and for a small fee to non-members but you can get help and advice all year round, if you want, from the more experienced players who also come to these sessions. Playing tennis in the fresh air is a much more fun and sociable way to keep fit and healthy than working out in a gym! We understand that it is hard for beginners to get into a sport unless they have a parent or school teacher who introduced them into the game when they were young and they have kept it up. Our Friday evening sessions are set up especially for complete novices of all ages, they are also ideal for people who played tennis in the past but are a bit rusty because they have not played for a while or have had an injury. You are welcome to come along and join in from your first visit. Come with your tennis kit if you have any, if not just wear suitable non-marking sports shoes, comfortable clothing and you can borrow a racket. 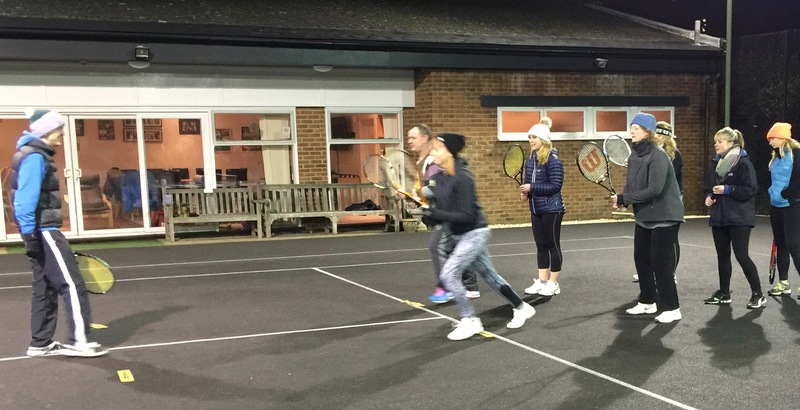 A testament to the success of these sessions is that most of the original “Friday nighters” some who had never played tennis before, are now full club members and quite a few are playing in both men’s and ladies teams. The Friday night sessions are hosted, normally by Chic. The host will introduce you to the other players and find you suitable games. There will be other beginners as well as more experienced members to make sure you get a good game. The first session is free and after that you can just pay a visitor’s fee (£5) when you play or you can pay an annual subscription to join the club (click here for membership details). I should also let you know that the bar will be open for soft as well as alcoholic drinks and bar snacks; many of the players stay for a drink and social after their games which is a good opportunity to get to know everyone. There is group coaching 6.30 to 7.30 most Friday nights which is free to Friday night members, £3 for non-members. Click the link below if you want to be inspired to come to our Friday evening sessions.